Joseph D. Hudek IV was arrested July 6 after witnesses said he tried to open an exit door aboard Delta Air Lines Flight 129 while it was over the Pacific Ocean. A Florida man accused of going berserk last July on a Seattle-to-Beijing flight, beating passengers and crew members with a wine bottle before being subdued, pleaded guilty Friday in U.S. District Court in Seattle to four federal felonies. Joseph D. Hudek IV, 24, will be sentenced in May on one count of interfering with a flight-crew member and three counts of assault on an aircraft. Hudek, of Tampa, faces up to 20 years in prison. Hudek was arrested on July 6 after witnesses said he tried to open an exit door aboard Delta Air Lines Flight 129 while the Boeing 767 was over the Pacific Ocean. There were 210 passengers and 11 crew members aboard the flight, the U.S. Attorney’s Office said. According to federal charges, Hudek — whose mother worked for Delta — was flying first class on a “dependent pass” and became violent when two flight attendants tried to stop him from opening a cabin door. Federal agents said he was able to move the lever halfway up. 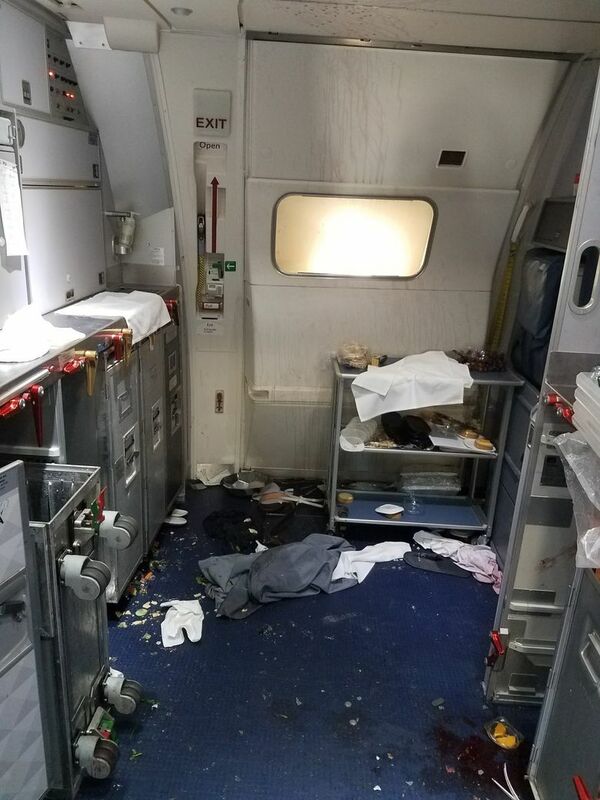 A melee ensued in which Hudek allegedly punched one of the attendants twice in the face, hit a male passenger in the head with a wine bottle and punched him several times. A flight attendant grabbed two wine bottles and hit Hudek with both, breaking one over his head. It ended up taking several passengers to restrain him before the plane returned to Seattle-Tacoma International Airport, according to a federal complaint. One of the flight attendants and a male passenger were treated for severe facial injuries, including bruising and bloody lacerations. Hudek has filed an affidavit with the court stating that he purchased and ingested “edible marijuana” in Seattle just before his flight. “Later, while on the airplane and after I had consumed the marijuana, I began to feel dramatically different,” Hudek said in the sworn document. The affidavit did not say how much edible marijuana he consumed. Hudek’s Seattle lawyer, Robert Flennaugh II, submitted an affidavit from Hudek’s personal physician, Dr. Joe Whitaker of Tampa, that known side effects of orally ingested marijuana can include paranoia, confusion, hallucinations and combativeness. His attorneys also submitted more than 300 letters of recommendation to the court, arguing that he had no history of violence or substance abuse. Hudek has agreed to pay restitution to the injured passengers in an amount to be determined at the sentencing hearing, according to the U.S. Attorney’s Office. He remains out of custody on bond, but is prohibited from traveling on aircraft.